Over the holiday, we had many quiet days. Partially, this was due to our crazy weather this winter but mostly because we were sick. James has been asking more and more about my spinning wheels. In our bedroom, I keep quite a few of my wheels set up to be able to sit down and spin when I can. Often one or more of my wheels has a project on it but currently, I don’t have any projects on any of my wheels*. *By the time this is published, I will have at least two projects going that I was in the process of planning while writing this! 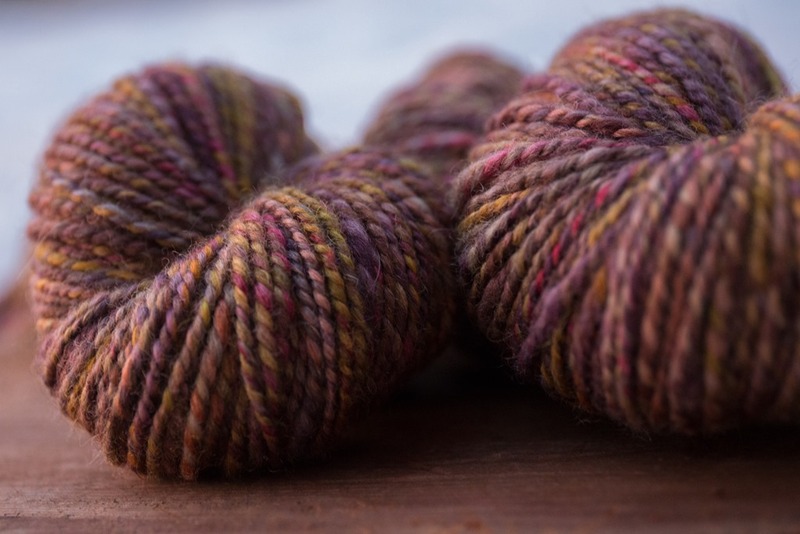 This quiet area in our room has become progressively more cluttered and is in desperate need of de-cluttering, vacuuming and dusting but I wanted to ply a beautiful combination drafted yarn prior to starting that mammoth project. 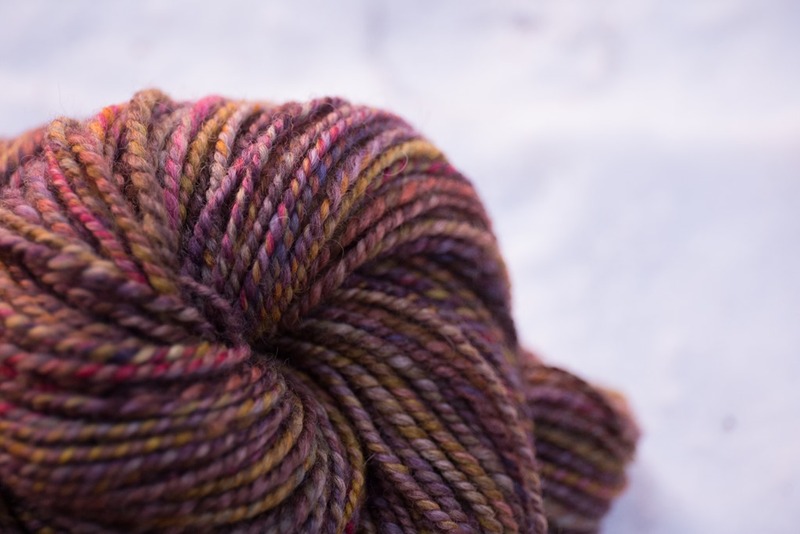 Mostly, I wanted to ply because well, it’s better than cleaning! But also, I was craving some ‘me time’ and the kids started off playing quietly in one of the other bedrooms. They were content, happily laughing and building a ‘camping site’ while I plied. Recently, I have taken to plying on my Mach II because of the huge bobbins. I find the wheel a bit much to spin singles on but overall, I like the feel for plying. The large bobbins help too! 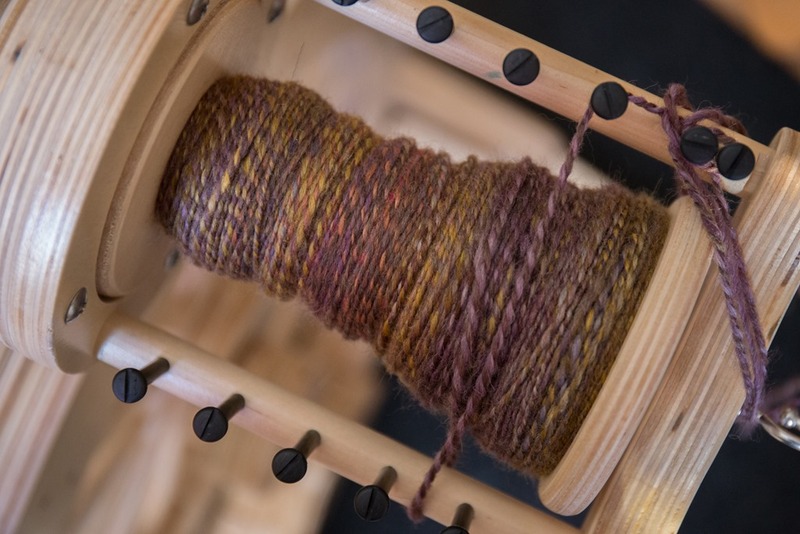 After plying, I can pull the bobbin off and switch to the skein winder, counting up yardage quickly and checking my WPI prior to washing (I like to compare pre and post-wash). After the kids had been playing for a while, they naturally gravitated into our room and onto our bed. Slowly but surely, they navigated over to my wheels – I have 4 stored in our room – and asked to spin. I set Norah up on my Matchless, just treadling and watching the drive wheel go round. 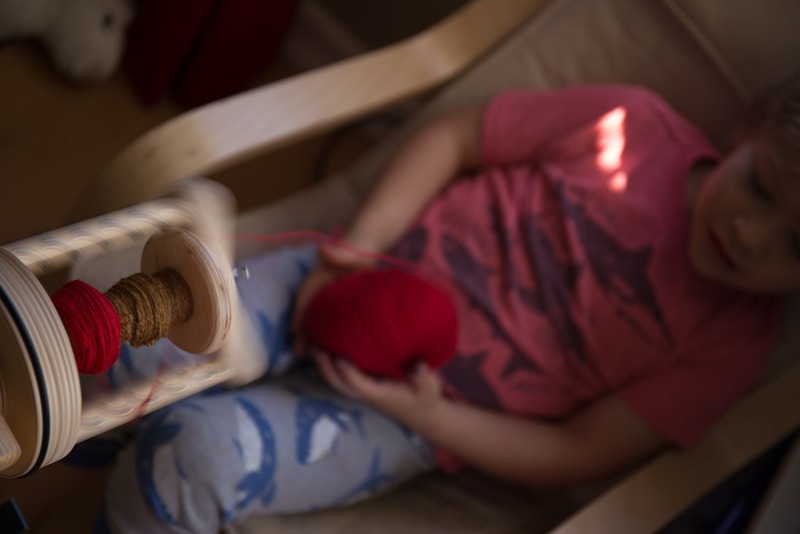 James wanted to spin for real though and that always poses a problem: The coordination between treadling and feeding commercial yarn onto the bobbins of the Pollywog always seems to be too complicated followed by very tangled yarn (and a very frustrated Mama). And to be honest, I was almost finished plying. Selfishly, I just wanted to finish. He kept asking. And I eventually gave in because he was asking really nicely. There was some KnitPicks Palette on my dresser and I decided to start him on that instead of finding anything heavier. I usually get him using a worsted weight yarn like old Cascade 220 or Berroco Ultra Alpaca. Within just a moment he had the coordination! What a difference a couple of months makes! I can’t believe his fine motor, which has always been astounding for his age but seeing the ‘ah-hah’ moment was incredible! And he was so incredibly pleased with himself – he was elated. It was cool. He even wanted to ply so after a while, we started a second bobbin and eventually, he had enough to put the two onto the ‘Lady Kate’ as he called it. 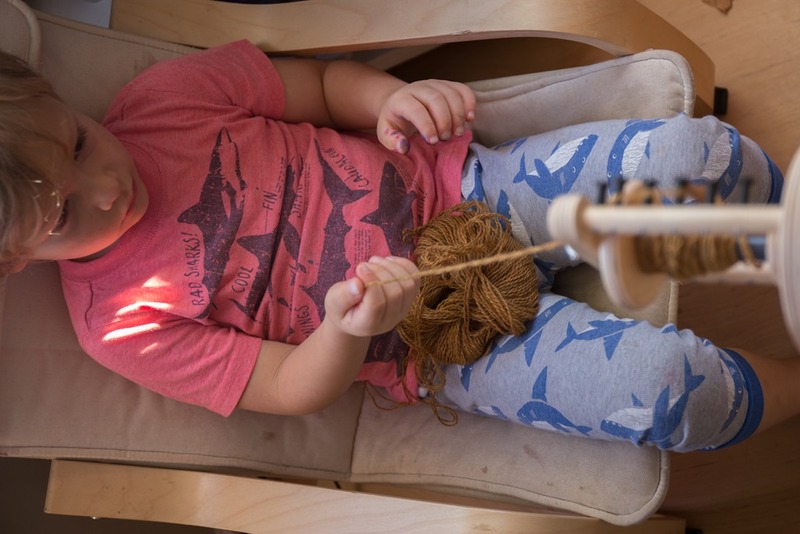 Plying was a little harder for him to grasp and I find my adult students often struggle with plying as well. It is a completely different movement and feel. By this time, he was getting tired and hungry – he’d been ‘working’ for over 2 hours – and we decided to take a break. He hasn’t wanted to try it again since but I’m going to wind off his yarn this weekend and show him ‘his yarn’ and see what he says! I’m hoping it’ll encourage him to try again one morning when he’s ready again. In the end, I finished my yarn and helped him make is own so I call that a First Class win! Have you taught your kids to spin? 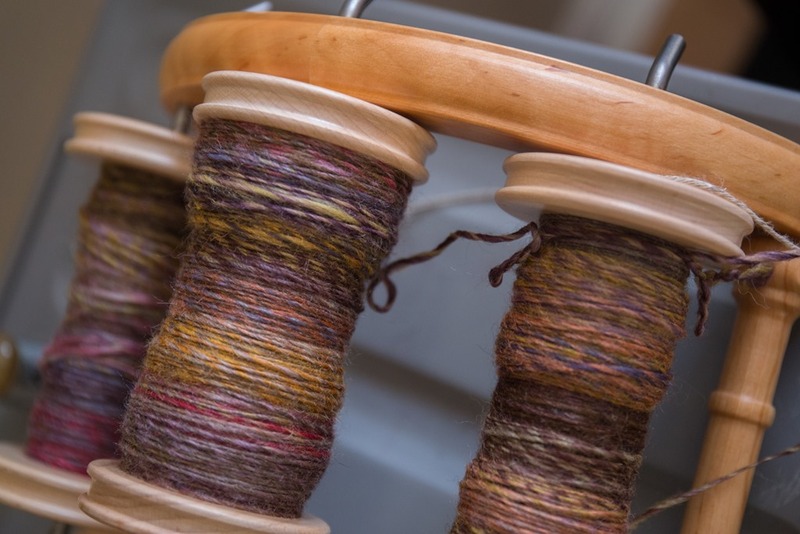 Did you start on a wheel or spindles? I’d love to hear your experience. My daughter has expressed interest in learning to spin. We started out a couple of years ago, with her sitting on my lap while I spun, but then recently we gave park and draft on a spindle a go. She hasn’t quite gotten it yet, but I’m glad the interest is there. This is so sweet! Spinning wheels are such kid magnets.